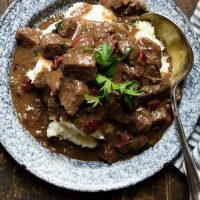 Delicious beef cubes, braised in red wine and flavoured with cranberries. You could also used canned whole berry cranberry sauce in place of the homemade cranberry sauce. For the cranberry sauce: Combine all ingredients in a medium saucepan and stir well. Bring to a boil over medium-high heat, stirring regularly, then reduce heat to medium-low and cook, stirring occasionally, until most but not all of the cranberries have burst and the sauce has thickened. Remove to a bowl. Cover and refrigerate if not using immediately. (Left-overs can also be frozen). For the stew, cut the stewing beef in to 1-inch chunks if not already that small. In a large, heavy-bottomed pot or Dutch oven, heat 1 Tbsp. oil over medium heat. Add 1/2 of the beef cubes. Cook, stirring, until evenly browned on all sides. Remove to a plate. Add another 1 Tbsp. oil to the pan and the remaining beef cubes. Cook until browned and remove to the plate. Heat 1 Tbsp. oil in same pan. Add the onions and cook, stirring regularly until golden. Return the beef to the pan. Add the wine, stock and 1/4 cup of cranberry sauce. Bring to a boil, stirring well with a wooden spoon to scrape up the browned bits from the bottom of the pan. Add a generous sprinkling of salt and pepper. Cover, reduce heat to medium-low and cook covered at a gentle simmer for 1 1/2 hours. Remove the cover at 1 1/2 hours and check that meat is tender. If so, add a further 1/2 cup of cranberry sauce. Stir to combine. Taste and add more salt and pepper, if needed. If the cranberry taste seems too subtle, add a bit more and stir in. Cranberry taste should be present, but not over-powering the beef. Simmer for a further 5 minutes. If sauce needs thickening, spoon out 3 Tbsp. of the stew broth and combine with 2 tsp. cornstarch. Add mixture a bit at a time back in to stew and cook, stirring, until sauce reaches desired thickness. Serve with a sprinkling of chopped fresh parsley. Especially nice over mashed potatoes. If desired, flavour mashed potatoes with a few teaspoons of horseradish for a lovely complement to the stew.